In 1968, a top secret military mission launched three chimpanzees into space. The goal was to test a new vessel designed for deep space exploration. Mookie, Yim-Yim & Steve were to be the first Earth creatures to travel to the end of the known galaxy and beyond. Few expected the animals to survive, but the data collected during the voyage would be invaluable for future expeditions. On August 25, 1968 their ship launched. Sold to the media as the launch of a weather satellite, it went unnoticed. For the next four years the vessel sent flight data and vital signs of the passengers, studied by only a few scientists with the highest security clearance. On January 19, 1972 the last communication was received. The ship had reached the edge of the galaxy and the passengers were still alive. Abruptly, all communications ended. Nevertheless, the scientists used the accumulated data to develop systems that would end up in the Space Shuttle, but the mission itself was forgotten. Then in early 2010, radio telescopes picked up an unknown object traveling at remarkable speeds. Scientists tracked it until it fell to Earth, landing in rural Indiana. The military responded and were shocked to find wreckage of the ship that had launched in 1968, still blasting an endless loop of Black Sabbath's “Master of Reality” and the first two Iron Maiden albums. However, the ship was found to be empty with no sign of the three chimps. The occurrence was swept under the rug, and scientists were left scratching their heads. Months later three men appeared claiming to be the very same chimps from the mission. They told of traveling to the Andromeda galaxy and being captured by a race of beings far more advanced than humans...the mighty Gorgantherron. They had been monitoring human progress for centuries and were appalled at humankind's behavior toward each other and their planet. The Gorgantherron used their superior technology to evolve the chimps into stunningly handsome men. They spent years listening to Doom and Black metal. 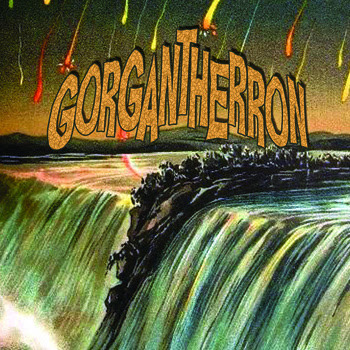 The Gorgantherron considered metal to be one of the few things the miserable humans had gotten right. The three were educated in guitar, bass, and drums, then hurled back to their home planet to warn humankind of the dire consequences of continuing their petty, selfish ways. "Back in December 2011, The Soda Shop introduced this outlandish three-piece Stoner/Doom band from Evansville, Indiana. Since then, the band has recently released a remarkable self-titled EP. Packed full of heavy-footed doom stomping, earth-shaking riffs, and soaring guitar solos, the band crushes all things in their way with a masterful blend of Stoner, Doom and classic metal. Standouts on this EP include "Monthra", "Assimilate" and the defining title track "Gorgantherron". Listen loud! Listen Proud! All hail Gorgantherron!"